The 2019 NFL Draft in Nashville, Tennessee is just over a week away, and all eyes are on college football’s biggest names to see what team they will join as they start the next phase of their football careers. At the same time, all eyes will be on the New York Giants, who have a total of 12 draft picks, to see what action they take, especially in the first round. In a time in the franchise’s history where their beloved 2-time Super Bowl winning quarterback is battling father time, the pressure is on the Giants’ shoulders to go out and find Eli Manning’s future replacement. Last year’s draft saw them pass up on guys like current Jets quarterback Sam Darnold to select phenom running back Saquon Barkley, a decision that despite his play will be a subject of debate for years to come. Although Barkley had a sensational, rookie of the year winning season and validated the Giants’ selection of him, the team finished with a 5-11 record, the trading of their very talented wide receiver, and the same major problem hanging around. 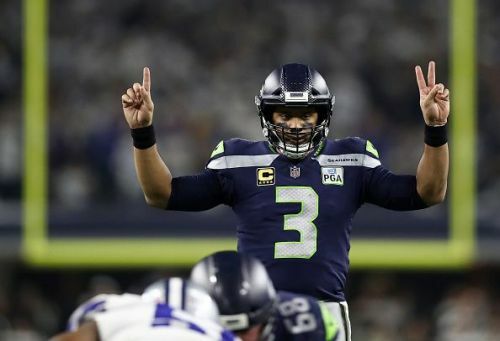 Recently, there’s been talks that Seattle Seahawks quarterback Russell Wilson, awaiting a contract extension from the team, has had interest in playing for New York and could come there if Seattle didn’t offer him a new contract. This all comes after the seventh-year, highly mobile quarterback finished 2018 with almost 3,500 passing yards and a passer rating of 110.9, per Yahoo Sports. However, the Seahawks at the eleventh hour responded to Wilson’s deadline demands. Late Monday night, Russell Wilson and the Seattle Seahawks came to an agreement on a new contract, spanning the next four years and totalling $140 million, per ESPN’s Adam Schefter. Included in the deal is a $65 million signing bonus and the ability for Wilson to call himself the highest paid player in the NFL. 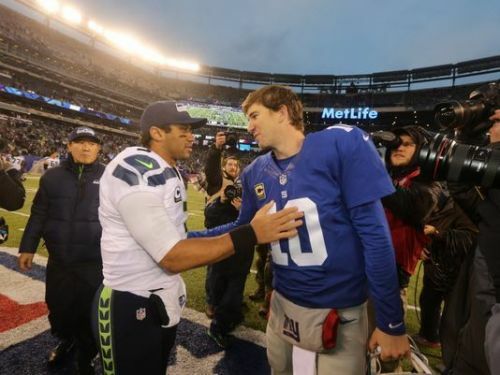 Now, with the hopes for Wilson out the window and Eli Manning heading into the final season of his contract with no guarantee of a resigning, the pressure on the Giants to draft a quarterback in this year’s draft has just gotten heavier. The Giants over the last few seasons have been a team ravaged by horrible performances, failed draft decisions, bad contracts, injuries, and constant drama. Team brass has made questionable decisions regarding star talents like Odell Beckham Jr who’ve helped Manning maintain his competitiveness despite being nearly immobile. Various position areas on the roster are bereft of strength and holes continue to be unfilled due to lack of cap space and draft capital. If the Giants organization does not do something to resolve some of these problems, they could be heading towards another difficult season full of missed plays and blown coverages, enraged feelings towards managerial power, and unanswered questions. By the end, they could end up with a vacant quarterback position and not a legitimate contender to fill it. Using the draft, where they will have a total of 12 draft picks with the first being at No. 6 overall, the Giants will need to prove that they have a plausible plan to rebuild this team and that they can start by using draft capital to fill the necessary deficiencies in the roster. The most important one is the quarterback position. Now, with the hopes for Wilson out the window, the pressure on the Giants to draft a quarterback in this year’s draft has just gotten heavier. The Giants do have deficiencies in other areas such as the offensive line, linebacking core, and defensive secondary, but the most important of these is the quarterback. At this moment, all the Giants have behind Eli Manning is Alex Tanney, who certainly is not starter material, and second year player Kyle Lauletta who hasn’t shown enough promise in the reps he has received. The Giants need a guy like Baker Mayfield or Kyler Murray, who can come in, be a playmaker, and increase the overall mobility of the offense. Quarterbacks like that are available in this year’s draft, i.e. Dwayne Haskins, and the team once again has a perfect opportunity to grab one. Luckily for the Giants, none of the other teams picking before them need a quarterback as much as they do. Besides the Arizona Cardinals who most likely will select Oklahoma quarterback Kyler Murray with the No. 1 pick, the 49ers, Jets, Raiders, and Buccaneers all have quarterbacks they like or have more important issues. This leaves the Giants with a great chance, pending they don’t trade down, to land a guy like Dwayne Haskins from Ohio State, who is talented, a big Giants fan, and once considered the top draft prospect before Murray came into the picture. In this past season as a sophomore at Ohio State, Haskins threw 533 times and completed exactly 70% of those passes for a Big 10 leading 4,831 yards. His touchdown to interception ratio was 50:8 and his passer rating reached 174.1, per ESPN’s loggings. Like Manning, he can scan the entire field, find the open man, and fit the ball in the tightest of pockets, the one difference is that his tapes at times show that mobility in and out of the pocket that the Giants so desperately need. This is not to say that the other quarterbacks in this draft can’t bring these characteristics to the Giants, but out of what’s available Haskins is the best option for the Giants to take. Once the Giants have their man at the quarterback position, then it will be time for them to focus the other eleven picks on the other roster positions of concern, especially the offensive line and secondary. Of course, the team has made some good adjustments to these areas in free agency, however some of those came in expense of then-owned talent in other key areas. The Giants do not have a ton of cap space like the Cleveland Browns or New York Jets, their MetLife counterparts, do. Therefore, it will be critical for the Giants to find guys in the draft or in a beneficial exchange of draft picks, that can immediately elevate the team to the competitive level they want to be in. Certainly, the New York Giants will be one of the interesting teams to watch throughout the 2019 NFL Draft, partially because there is just so much hanging in the balance for them in it. Giants general manager Dave Gettleman has said numerous times that the team has the goal of rebuilding correctly yet competing at the highest level at the same time. While the two parts to this goal are conflicting in nature, it sure is possible if you do the right things and make the right moves. It’s been a constant debate as to whether Gettleman has made the right moves thus far, but he and the Giants can change the narrative by taking care of business in Nashville.